Brent rallied significantly this week again, at some point trading over 48 $/b, amid renewed volatility. These are the highest prices since early November. The energy intelligentsia seems at a loss to explain this four week long rally and the petroleum related news suddenly became scarce. It will be at least four months before the first public data on petroleum extraction is published; only then can it be fully understood what is behind these price movements. A regular reader of this review has probably noticed a certain animosity towards the mainstream press. By and large journalist seem unable, or unwilling, to report the relevance of the energy transition the world is going through. As always, there are exceptions. Daniel J. Graeber writes for the UPI and his articles figure frequently in this review. Starting with a report issued by Wood Mackenzie, Daniel J. Greaber just wrote an article proposing a peak in world petroleum extraction. Never using obvious terms, the picture laid down in this article is fairly clear nevertheless. Global supply-side pressures could reverse within 20 years as low crude oil prices crimp spending on exploration and production, Wood Mackenzie finds. [...] Lower oil prices means less capital is available for energy companies to invest in exploration and production activity. If that situation doesn't improve, experts with analysis group Wood Mackenzie said in an emailed report the global oil market may face long-term shortages. "Over 7,000 conventional fields have been discovered in the last 15 years and, although these developments will play a critical role in securing future oil supply in the medium term, modeling a continuation of poor exploration results shows that the market could see a 4.5 million barrel per day shortfall by 2035," Patrick Gibson, director of global oil supply research at Wood Mackenzie, said in a statement. Loose data points show where petroleum consumption is headed. Per capita figures in Asia are still incredibly low compared to those in Europe and any sort of economic growth there can only mean increased needs. Demand silently shifts rightwards in these times of supply destruction. After registering the fastest pace of growth in 15 years, India's fuel demand is likely to rise by 7.3 per cent in 2016-17 fiscal, lead by robust expansion in consumption of petrol and diesel. [...] Diesel demand, which soared 7.5 per cent to 74.6 million tonnes last fiscal, is projected to further go up by 7.7 per cent to 78.11 million tonnes. Nigeria is increasingly one of the countries most affected by the current supply destruction cycle. While it is Venezuela making the juicy headlines, the outlook in Nigeria is no less dramatic. Nigeria’s oil output is set to decline sharply over the next decade, according to industry executives and analysts, because of uncertainty over promised reforms to the cash-strapped and debt-laden state oil company. President Muhammadu Buhari came to power a year ago partly on a vow to shake up Nigeria’s oil industry, where corruption and mismanagement have long held back production. With 37bn barrels of crude, Nigeria is Africa’s top oil producer and has the 11th-largest oil reserves in the world. [...] Wood Mackenzie, the energy consultancy, has cut its output forecast for Nigeria by more than a fifth, to 1.5m barrels a day on average over the next decade. Its previous forecast for the period was 2.1m barrels a day, roughly in line with present output levels. Roger Andrews furnishes valuable thoughts on the much expected extraction "freeze" agreement that failed two weeks ago. Understanding why petroleum prices rallied in the wake of this failed agreement is not so difficult. Can OPEC “freeze” production, or is it already frozen? Between July 2014 and January 2015 the price of OPEC’s oil “market basket” fell from over $100/bbl to less than $50/bbl, causing considerable hardship to the OPEC countries who rely on oil exports to finance their national budgets – which is all twelve of them. Under these circumstances the logical reaction for a cash-strapped, oil-rich country would be to pump more oil to increase revenues , yet only two – Saudi Arabia and Iraq – actually did so. The remaining ten, which account for over 50% of OPEC’s current total output, seem to have already been pumping as fast as they could or were prevented from doing so by civil war (Libya) or sanctions (Iran) or by other factors outside their control. The implication is that all the talk about freezing OPEC production at January 2016 levels may be just so much hot air. With Saudi Arabia also now pumping at capacity according to Euan’s March vital statistics post OPEC may no longer be capable of increasing production above current levels even if it wanted to. Canada is becoming a remarkable case in this supply destruction cycle. This country claims to the largest petroleum reserves in the world but it is struggling to keep its industry alive and maintain its extraction rates. 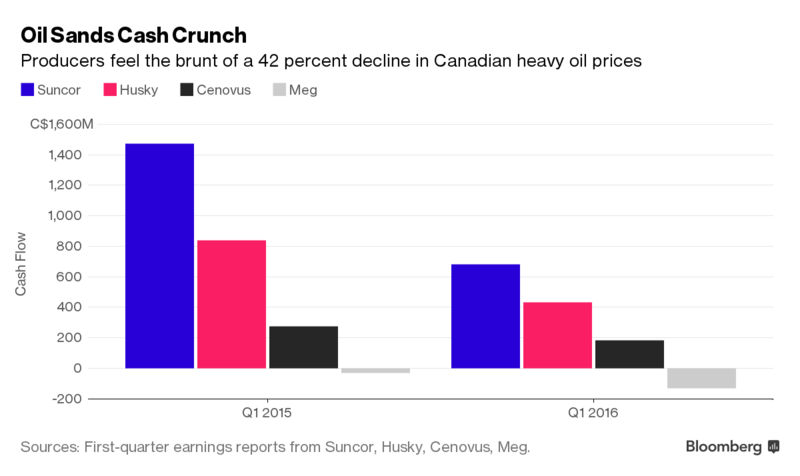 “So far, 2016 has been a brutally challenging year for our industry,” Brian Ferguson, chief executive officer of Cenovus, said Tuesday on a conference call to discuss the results. An interesting side to the "shale oil" story in the US. While the finance industry keeps largely bankrupt petroleum companies extracting all the petroleum they can, service companies are not endowed with the same luck. These are opposite trends that may bring some surprises down the road. Two of the three largest oil rig operators and fracers are considering pulling back from the North American market as losses mount. Schlumberger—after posting its first North American operating loss since at least the turn of the century, according to Barclays Plc—is evaluating whether it’s worth temporarily shuttering its business in the region. Baker Hughes said Wednesday it has decided to limit its exposure to unprofitable onshore fracing work in North America because of the "unsustainable pricing." It’s the first time in at least a decade that those companies and Halliburton, the big 3 in oil services, all lost money in the region during the first three months of the year, according to Bloomberg Intelligence. "Activity is coming down to basically critical-mass type of levels," Schlumberger Chairman and CEO Paal Kibsgaard told analysts and investors Friday on a conference call. "What’s the benefit of taking the losses versus shutting down and then making the investments later on to start back up again?" In recent months, the mainstream press in Europe has been referring to a claimed "unity" government in Libya, likely in preparation for some sort of military intervention to quell the extremist organisations that were helped deposing Khadaffi. The proof is in the pudding as it is often said. This recent news of independent petroleum shipments out of Cyrenaica show an entirely different reality in the field. A cargo of 650,000 barrels of crude left the Libyan port of Hariga yesterday, in the eastern part of the conflict-torn country, sparking what promises to be another phase in the conflict as the Islamic-leaning government in Tripoli vows to block the maneuver. This premature attempt at crude oil exports could have huge implications for international efforts to unite the country under the new Government of National Accord (GNA), which was formed with UN support, because eastern Libya is controlled by a government based in Tobruk, which has not yet recognized the GNA of Fayez Serraj. The eastern government works with an eastern division of the Libyan National Oil Company (NOC). The western division of the NOC also has international backing and recognition as the original NOC, while the eastern one is considered a breakaway formation. The latter has been trying for a while to start its own oil exports but has not been successful so far, thanks to resistance from NOC’s international oil trading partners, including majors such as Glencore and Vitol Group. Now, it seems, the breakaway NOC has managed to find a buyer in the face of another trading firm, UAE-based DSA Consultancy FZC. Lithium is developing into the greatest resource story of 2016, with the commitment of several auto-makers to the production of large numbers of electric vehicles. The press regularly refers to efforts towards mining permits for this metal in Europe and North America. What prices can sustain such mining operations? What will it mean for the affordability of electric mobility? Is This The Hottest Acreage In The Lithium Rush? As our lithium-dependent energy revolution unfolds, prices soar and supply remains euphorically tight, a savvy newcomer is the first to cast a much wider exploration net over America’s ground-zero lithium state of Nevada, hedging smart geological bets that there’s lithium beyond Clayton Valley. The lithium space is becoming a frantic game of who can get their hands on the choicest new mining acreage and who can launch new production fastest. And in North America, it’s all going down in the state of Nevada, which is the staging ground for a U.S. lithium boom that will feed the manufacturing beasts for everything from EVs, battery gigafactories, powerwalls and energy storage solutions to the long and growing list of consumer electronics that we use every day. Lithium demand just for electric vehicles is set to rise by 70,000 tons every time EV market share jumps only 1 percent. And this fails to account for the brilliant launch of Tesla’s Model 3 EV on 31 March, which saw 325,000 advance sales worth $14 million in only one week, definitively bringing the electric car into our mainstream. Considering only the EV market—and ignoring the already steadily rising demand for lithium for consumer electronics and the need for massive power storage solutions—the lithium market could triple by 2025. All of this has made a previously dusty and unattractive area of Nevada—Clayton Valley—one of the most important and significant places in America. But while everyone’s narrowly focused their attention on Clayton Valley, Nevada’s geothermal footprint tells a story of much greater potential. This review often bashes the German government's policy towards solar power. However, in what concerns wind power, the German chancellery is still full on, even if levelised costs can actually be higher than solar. Naturally, it is not the names of Steffi the web designer or Hanz the boer we see associated with these mammoth wind projects. On Monday, Statoil ASA (ADR) (NYSE:STO) announced that it has entered into a contract with E.ON SE (ADR) (OTCMKTS:EONGY) to develop the Baltic Sea Arkona wind farm. According to the energy producers, the investment would cost around $1.35 billion and the wind farm is situated off the coast of Germany. The wind farm is expected to carry out its operations in full force latest by 2019. The firms would each hold 50%. Around 400,000 households would be served by the output of the wind farm. [...] According to E.ON, the 385 megawatt project will provide optimal conditions to mitigate the costs of offshore wind. It would also be a huge step toward the company’s “goal of making renewables truly competitive.” The project would make use of turbines from Siemens, the German manufacturer. And closing a musical suggestion. I wish you a fruitful week.